Years ago I heard that a friend of mine had drunk the proverbial “kool-aid” and become a, gasp, Modeler. I had no idea what that meant. But, I was soon to find out. The date was September 2013, and I was headed to Indianapolis for the American Chemical Society National Meeting. Laura Slocum was the chair of what was then called “High School Teacher Day.” She had planned a day of wonderful activities that used white boards and probes, where we teachers, acting in “student-mode,” were experimenting with gas laws. I was hooked and extremely curious. I was lucky enough to be able go to national and state meetings over the next few years where Laura, Erica Posthuma-Adams, and Larry Dukerich shared snippets of strategies that they use in Modeling InstructionTM in three-hour workshops. Here is my disclaimer: I am not in complete control of my curriculum at my school. Most teachers are very likely in the same boat. So I was not sure if I could really become a Modeler. I came back to school and the reality that I could not follow the order of topics prescribed by AMTA. That does limit how much Modeling I can do in my classes. I teach with other colleagues and we are expected to do basically the same thing in the same order, giving the same tests, etc. So, I decided to implement my own mini-modeling curriculum. I use the activities and teaching strategies where they fit in my prescribed curriculum. And it works great! I use parts of the unit 1 Physical Properties of Matter when we begin our course. I use the Energy units, both 2 and 3, when we do calorimetry and phase changes. We use the Energy Bar Charts as we work through this content. Using the charts really help students visualize changes in energy. When we study gas laws, we do experimenting with PTV and n with the Vernier Probes. I teach my students to do PVTn tables just like in the modeling program. I also do the usual gas law equations. I let my students choose which way to solve problems. For stoichiometry, I teach the traditional dimensional analysis and BCA tables. Again, my students choose which way works for them. We even do the Sticky Tape provided by AMTA to learn about charge. Probably the most significant change I made in my teaching has been using whiteboards. We whiteboard labs, problem sessions, review work, demonstrations, particle diagrams, and just about anything else we can think of. My students take pictures of the white boards and share them in google folders. I love being able to see, in bold bright colors, exactly what my students are thinking and how they’ve internalized what we’ve learned. I’m excited that this summer I am planning to take the Chemistry Modeling 2 workshop. I’m moving to AP Chemistry officially after 34 years of teaching. I love the idea of using the IMF, Equilibrium, and Acid Base units with my students next year. I’ve also heard that the electronic structure and periodicity units are outstanding. So my take-away is this… I am a ModelerTM. Maybe not in the traditional sense of the word, but I am indeed one. I guess I really did drink the kool-aid. Maybe you should try to be one too! There are two workshops, Chemistry 1 and 2, running from July 16th - July 27th as a pre-conference workshop at BCCE. The cost for the workshop is $600 and housing is available in Notre Dame residence halls, if you desire, for $55/night (double occupancy) and $66/night (single occupancy). The Chem 1 Workshop will be lead by Ray Howanski -- He is an amazing workshop leader and will really help you to have not only a clear understanding of Modeling Instruction, but also how to implement it into YOUR classroom. Chem 2 Workshop will be lead by Larry Dukerich -- Larry is one of the initial developers of the Chemistry Modeling framework and continues bringing new ideas and clarity to the current framework. I had the opportunity to take Chemistry 1 with Larry in 2016 and I absolutely loved his style of instruction and suggestions for inclusion in my classroom, too. Information about registering for the workshop is available on the BCCE 2018 website. BCCE is a phenomenal opportunity for High School Chemistry Teachers. I am the Pre-College Program Chair for this year’s BCCE, and I believe we have put together an amazing program for high school teachers, and there are also daily workshops throughout the conference where you can learn lots of valuable and interesting things to bring back to your classroom. Not ready to commit to a two week Modeling Workshop? You can find presentations and workshops about Modeling within the BCCE program. The conference starts on 7/29 and runs through 8/2. 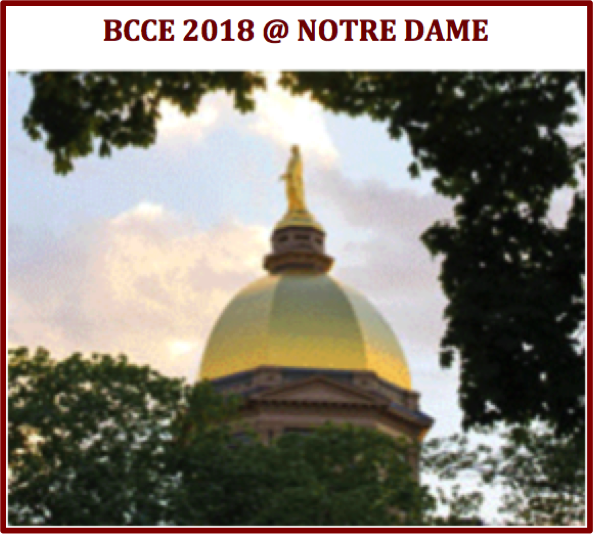 You can find a wealth of information on the BCCE 2018 homepage. Early Bird registration rates for BCCE are available through June 1st. Unfortunately, not everyone can make a trip to BCCE work in their schedule. If you are interested in Modeling Instruction, there are many other workshops around the country. Check out the list on the AMTA website. They are organized by topic and location. I hope you can fit one into your schedule.